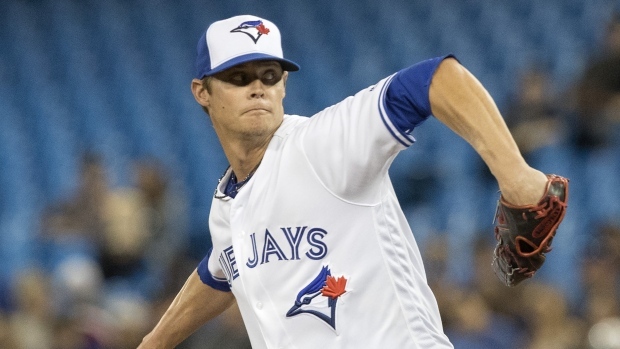 TORONTO — Clay Buchholz prepared for his first start in a Blue Jays uniform by rewatching film of himself pitching at Rogers Centre. As a former mainstay in the division-rival Boston Red Sox rotation for the better part of a decade, the veteran right-hander had a lot of footage to choose from. And when his six-inning start was over on Saturday — and his new team had come away with a 3-1 comeback win over the Tampa Bay Rays — the 34-year-old felt as comfortable as ever in his new home stadium, where he holds a career 2.57 earned-run average. "I've pitched here a lot, just on a different side of the field now," Buchholz said. "I tried to use that to my advantage and go back and look at games from previous starts that I had here, and just try to manipulate the baseball to do what I want it to do." Buchholz allowed six hits and one run — an RBI single from Austin Meadows in the sixth — and struck out two in the no-decision in his first start major-league start since last September. He signed a one-year deal with Toronto during spring training and had been rehabbing from an elbow flexor strain suffered last season with the Arizona Diamondbacks. "I feel good. I feel healthy," Buchholz said. "I've done it a couple times where I've gone out and it's a max effort every time you throw and I think hard times come from that. So I used a little bit of what I grasped in Arizona — less is more sometimes." Lourdes Gurriel Jr. drove in a pair of late runs as Toronto bounced back from a 1-0 deficit to spoil a stellar outing from reigning American League Cy Young winner Blake Snell, who pitched six innings of one-hit ball with nine strikeouts and a walk. Gurriel has driven in five runs over his last four games after starting the year with two RBIs in his first eight. "He's got a history of hitting and he's only had what, 50 at-bats, 40 at-bats? So it's coming," Blue Jays manager Charlie Montoyo said. "That was a big (hit) there, good for him." The seventh-inning rally ignited a Blue Jays offence that has been mostly dormant through much of this season. Montoyo, however, gave Snell all the credit for keeping his hitters off-balance during Saturday's game. "He's one of the best pitchers in baseball, that's just it," said Montoyo, who served as a coach with Tampa for four seasons before he was hired as Toronto's manager in October. "I could give him all kinds of compliments but he's just one of the best pitchers in baseball. "He's got all the pitches — a good fastball, a good curveball, a good change-up, he's very good." Thomas Pannone (1-2) worked the top of the seventh to earn the win while Roe (0-2) was saddled with the loss. Toronto's defence also committed three errors on the day and Montoyo credited the Jays bullpen for keeping things together. "That's why we have to give our pitching credit, to minimize (the damage) and they did," he said. "Our bullpen was outstanding. We made some errors but our guys came out of the 'pen and we got the guys out. ... We made a couple bad plays but our bullpen saved us." NOTES: Infielder Richard Urena was optioned to triple-A Buffalo before the game to make room for Buchholz on Toronto's roster. ... Attendance was 20,771. ... Marcus Stroman will start for Toronto on Sunday in the finale of the three-game series. He's 5-5 with a 4.58 ERA in 13 career starts versus Tampa Bay.